The Alpinestars Highlands Gloves are the new ADV gloves in Alpinestars Spring/Summer line up for 2017. The outer shell is constructed from durable goat leather and 3D mesh on the back of the hand. The premium, full-grain leather palm construction is durable and offers excellent abrasion resistance. The advanced over-molded polymer knuckle protector excellent impact performance. The palm and thumb are padded with energy absorbing EVA foam for additional protection. 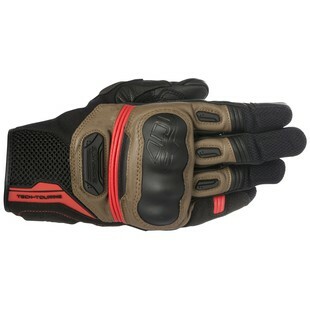 Alpinestars’ exclusive ergonomic stretch insert between the palm and thumb improve agility and comfort. The fingers are pre-curved to reduce rider fatigue while offering excellent fit. The index fingertip and thumb are touchscreen compatible. These gloves provide maximum breathability for hot weather riding, while offering a solid level of protection and comfort for on-road and off-road riding.